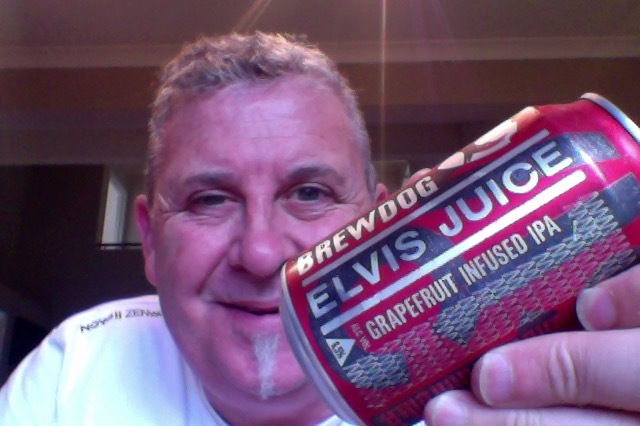 That’s right, BrewDog Elvis Juice. A Grapefruit infused IPA . Who Knew. Well Elvis Dickie & Elvis Watt knew is who knew. This is the beer they make at BrewDog. The red can is 330ml of a beer that is 6.5% ABV, and 40 IBU things, making it 195 calories and 1.69 standard drink units. This IPA has a caramel malt base, supporting a full frontal citrus overload – grapefruit peel piled on top of intense us aroma hops. Waves of crashing pine, orange and grapefruit round out this citrus infused IPA. You get a real fish of that grapefruit pith aroma, very much, and oranges. It is a lovely orange pour and even in the awkward wide mouth glass pours with a decent attempt of a head that settles into a film. Not sure that the wide mouth does much for the aroma concentration which is diluted and less. Very full of malt and a dry finish there is this bit between the sweetness and the dryness where there is a spike of citrus grapefruit tartness. And Oranges. It holds up well, but I did notice the alcohol tang as it got warmer, and the bitterness became a little sharper and stabby. But I do like that intense grapefruit slug that this has, and I don’t get to have grapefruit at all in my diet, age and infirmity mostly, not lack of desire. I like the way that it warms down, but then it settles to that lowest denominator that is sweetness and that begins to be a bit cloying and overly sweet. 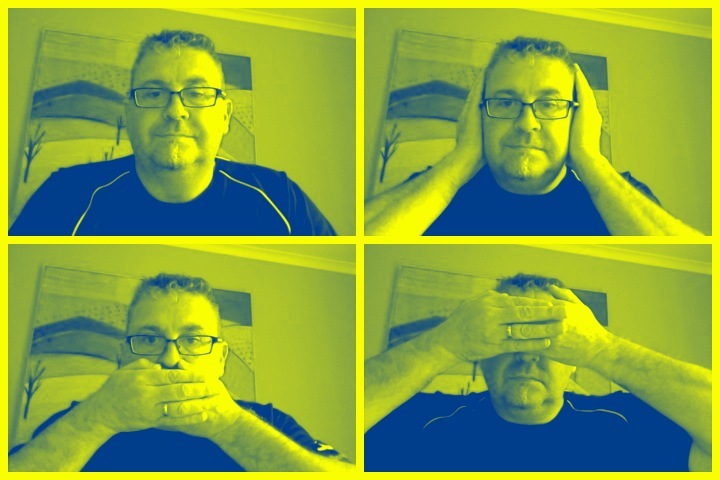 Having said that I did enjoy it, I learnt something, it made me smile, and the music I had on wasn’t so bad either, so most of the boxes ticked. The pdubyah-o-meter rates this as 8 of its things from the thing. I wish the aroma had been more persistent, and it had a better head. and it kind of settles down to a sweet fruity kind of middleness, which isn’t bad but would be a test if you had more than a couple of cans. Where did I get it? BeerJerkNZ beer club of course but it’ll be out an about. Am I enjoying it? I am, but I think that a can is my limit of enjoyment. Would I have another? I might at another time. Would I share with a friend on a porch and set the world to rights? You know that grapefruit and citrus are go-to words on IPA and this might be a way of highlighting that part of the beer, even if they loaded it up. I would as a beer benchmark, I don’t know that I would as a benchmark beer. 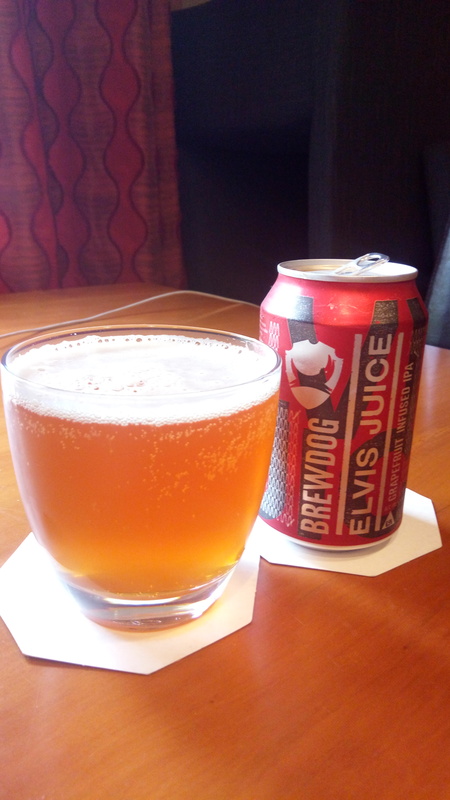 This entry was posted on November 24, 2016 by Philip Walter in Beer, Beer of Scotland, Beer Review, Brewdog, Craft Beer, Critic, India Pale Ale (IPA), Justsaying and tagged Alcohol by volume, Beer, BrewDog Elvis Juice, craft beer, Grapefruit IPA, India Pale Ale, IPA.